Want to experience three of South East Asia's most fascinating countries? We love the way SpiceRoads Saigon to Bangkok tour uses English speaking, local guides to introduce the very best of these extraordinary cultures. Journey from the iconic Mekong Delta to the spiritual temples of Angkor Wat. Ride along quite back roads, and cross mighty rivers. From shining capitals and colonial relics to tribal trails and humble homesteads. Your next incredible journey awaits. The road surfaces on this tour are mixed. We ride a combination of good quality tarmac, wide dirt tracks, and broken roads that are sometimes badly potholed but easily navigable by bike. The terrain is predominantly flat. Only on a few days do we cover longer distances (90-95 km), so experienced riders will find the distances long enough to challenge them, while less experienced riders are easily able to travel at a more relaxed pace. Biking Conditions: This tour follows a mixture of good condition tarmac road to potholed or broken ones and vehicle-width dirt paths. No off-road riding experience required. A support truck is almost always available to help when required, except on some parts of the very narrow paths of the Vietnam Delta. But you will always have your guides with you at all times. Cambodia has a tropical climate with fairly high humidity. There are three seasons: from March to June it is hot and dry, with temperatures between 27 and 40C, with night temperatures in the 20s. The rainy season is from June to October. The cooler season is from November to February, with average temperatures between 20 and 30C. Meals are included as per the itinerary where B = breakfast, L = lunch, D = dinner. Most meals are local and feature noodles, rice, curries and soups. Cambodian cuisine is a mixture of Thai, French and Chinese dishes and we make sure you can sample a wide variety. Any special dietary requirements can also be catered for as well. Please let us know at the time of booking. Thai baht and US dollars are widely used in Cambodia, especially in larger cities and towns. In smaller towns and villages, riels are usually preferred. There are ATMs in Siem Reap, however, machines dispense US dollars. Spend riel before departing as no one will exchange them for you once you leave. All nationalities require a passport for entry into Thailand. Please ensure your passport is valid for at least 6 months from the date of entry. If staying less than 30 days then a visa in advance is not required by European, North American, Australian and many other nationalities. You will need to show proof of an onward flight out of Thailand to be eligible for the visa on arrival. This is strictly enforced. Thailand generally has a tropical climate with fairly high humidity. The North and Central region has a tropical climate with fairly high humidity. Northeast Thailand has a humid hot and dry weather alternatively with medium rain. And the South of Thailand has a tropical climate with fairly high humidity. SpiceRoads does not require you to pay a surcharge for travelling alone. We will arrange for you to share accommodation with another traveller of the same gender and if we cannot match you up we will provide a single room at no extra charge. If you prefer not to share a single supplement is payable to guarantee your own room. The cost of the single supplement is listed above. The Thai currency is the baht. ATMs, which are abundant, are the easiest ways to get Thai baht. Have a supply of US dollars in cash on hand, just in case your card doesn’t work. Banks or the more rare private moneychangers offer the best foreign-exchange rates. Credit cards are accepted in big cities and resort hotels but you’ll need baht for family-run guesthouses or restaurants. Please make sure your passport is valid for a minimum of 6 months beyond the duration of stay in Vietnam and that you have at least two blank pages. Most nationalities require a visa for Vietnam, however 17 nationalities are exempt, including British, German, French, Spanish and Italian citizens. These five nationalities can stay up to 15 days, however they must acquire a tourist visa if staying longer. For a list of countries exempt go to this page. For 46 nationalities – including Australians, Canadians and Americans – an e-visa can be obtained. This must be applied for and received before departure for Vietnam. The fee for the e-visa is US$25 and then the visa is issued on arrival at international airports for another fee. Note that the e-visa takes 3-5 working days to process and you must submit a scanned copy of a photo and of your passport when applying. Print the approval letter to present upon arrival in Vietnam to acquire your visa. Nationalities not on the electronic visa list can obtain a pre-approved entry visa online before arrival in Vietnam for a fee, however, the visa is still issued on arrival at international airports. A visa for Vietnam can also be obtained from any embassy worldwide, here's a list of locations. A tourist visa is valid for a single 30 day stay. You must specify your arrival date when applying for a visa and it is from this date that the 30 days will be calculated. When picking up your visa check to be sure the dates match your travel plans and that it is stamped directly into your passport as it will not be accepted if it is stapled in or loose. Weather in Vietnam can vary quite considerably according to distinct climate zones. Due to regional climate differences there are no good or bad seasons to visit Vietnam. The North of Vietnam experiences cool, damp winters between November and April with temperatures in Hanoi falling to around 15°C. The summer months from May to October are hot and dry. A pleasant time to visit is spring (March-April) or autumn (October-December). The best time to visit the north of Vietnam is from September to December when it isn't so humid. The weather turns quite cold and wet in January and this continues until March. The humidity can prove oppressive from May to the start of September and there's a danger of flooding. Keeping you completely hydrated is a job we take very seriously. Cold water, some energy-restoring local fruit and soft drinks are included in the tour price while riding. Soft drinks and other beverages during meals are not included. Beer is freely available everywhere in Vietnam, but is NOT included in the price. The official national currency is the Vietnam dong (d), but the US dollar is widely accepted in tourist centers. However, in smaller towns and villages the dong is preferred. ATMs are available in all major tourist destinations and big cities. Vietcombank has the best network with a limit a single withdrawal limit of 2,000,000d (about US$125). Most major currencies can be exchanged at leading banks in Vietnam, but the US dollar is preferred away from the tourist centers. Changing US$100 will make you an instant millionaire! You cannot legally take the dong out of Vietnam but you can reconvert reasonable amounts of it into US dollars on departure. Mountain Bike Hire is available. Cost would be £150 pp for the duration of the Saigon to Bangkok by Bicycle Tour. 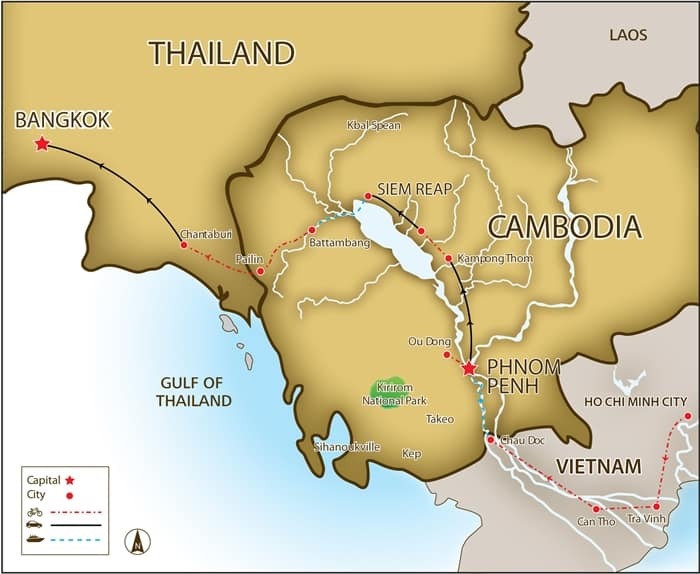 Full balance is required 10 weeks before the date of the Saigon to Bangkok by Bicycle Tour.